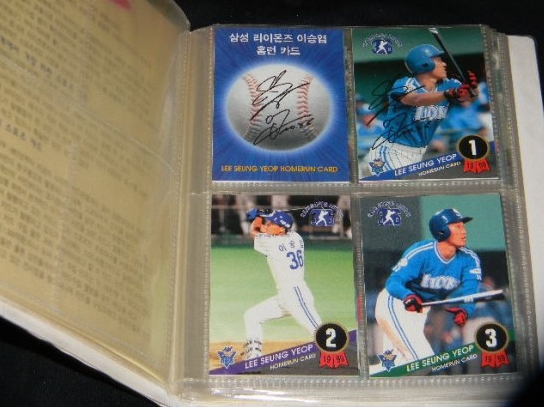 I have seen this set being sold by Korean collectors (whom I believe over-value their cards) for W150,000-W200,000 along with a folder, but unsure if this folder came with initial give-away. I was able to trade for this set (bought for Y5500 in Japan) with my friend Jin in Japan, so I was able to save money. 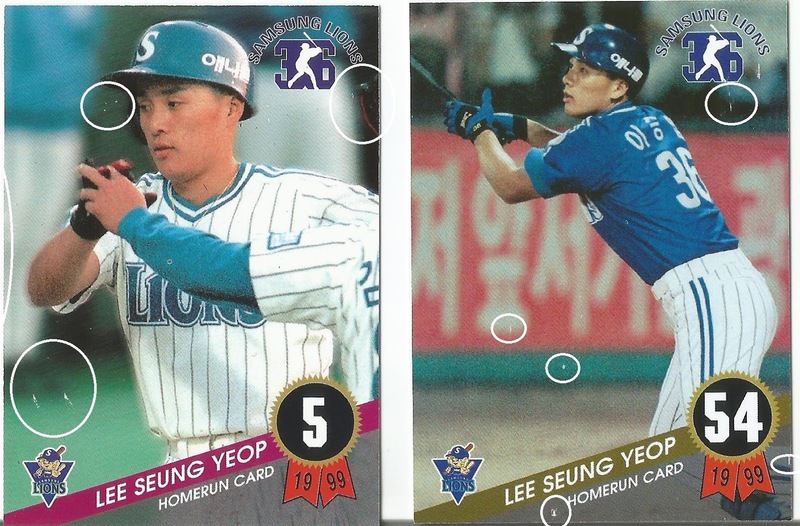 I traded him several cards of Korean players such as Bum-ho Lee, Byung-kyu Lee, Chang-yong Lim, Byung-hyun Kim as well as two plaques of SK Slugger Jamie Romak. 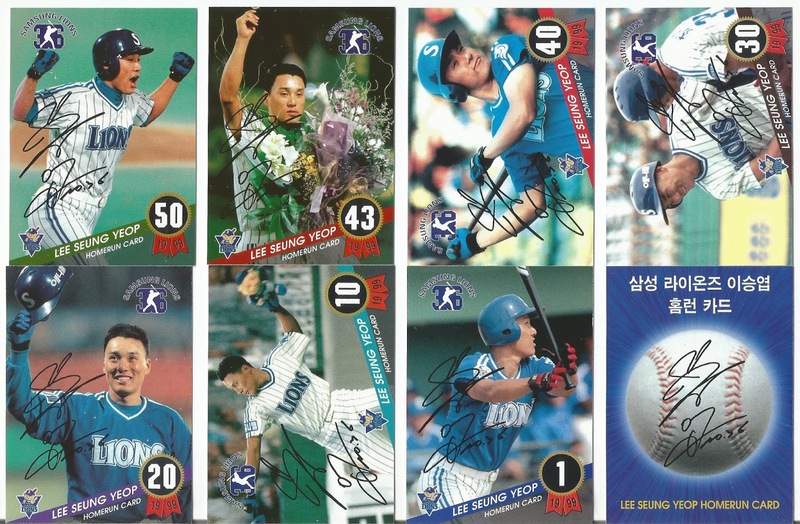 He also traded me several of these players' Japanese cards. 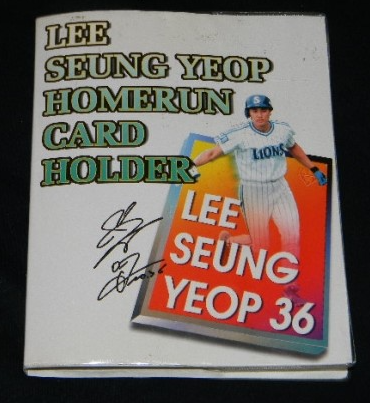 He has also purchased my custom sets and enjoys collecting cards and memorabilia of foreign players. 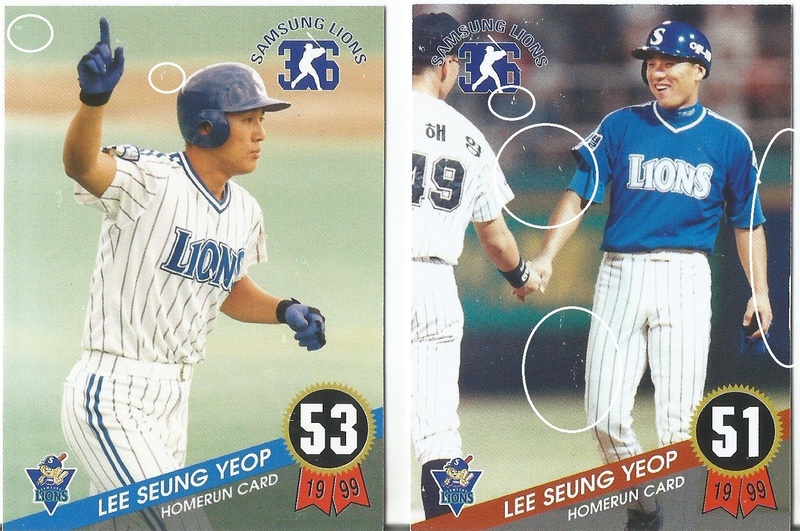 I believe the photo below of the folder for this set was given away at the same time as the cards, perhaps the cards were already in the pages. I will try to find out more. I have seen numerous sellers posting photos of this set with these folders so the folders must have been released with the set, not custom made by someone. Though, I could be wrong because the folder cover image appears to below low-resolution and on cheap paper, so they may very well be custom-made. I have also heard from a seller on eBay that the last four cards of the set, cards #51, #52, #53 and #54 were released after the initial 50 cards. All the cards in my set have the same serial number of #1057/1999, so I am unsure if this is true. The backs include lots of great information, almost everything you would want to know. Each card is specific to the day each home run was hit along with what type of pitch was thrown (fastball, slider, forkball), how fast the pitch was (km), how far the ball (m) was hit, the count/outs and where it was hit. 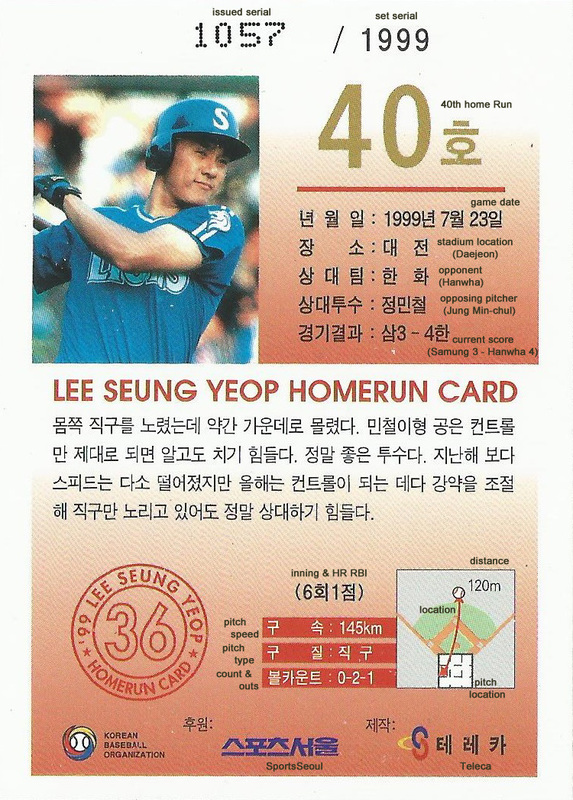 I specified on the card what each piece of information in Korean means. I was excited to get these cards in hand and get them online in a checklist. I was very disappointed at the quality of these cards. The photos themselves and the feel of the cards I personally like, but the resolution isn't great, many with white blemishes/blobs, not physical damage on the card, but graphically. I am glad I have these uploaded to TCDB now but I am hesitant on getting them graded because these will not grade out very well. I don't know if I have a bad set or if they are all like this. My friend bought the set online and the set came in a plastic case, so it didn't come with a folder. Here are a few examples of what I am talking about. Again, not sure if I bought a bad set. If I did, I will look to buy a new, cleaner one that I may grade.